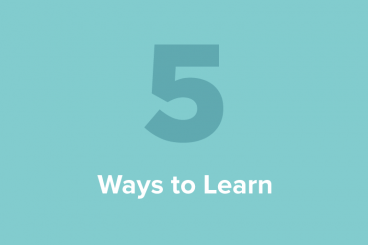 5 Ways to Learn Web Design: Which Is Right for You? The web design education industry has exploded from a small niche to a powerful, continually expanding force. Countless people all over the planet are interested in learning about how to build and design websites, and tons of companies are cropping up promising the ultimate solution. The good news for you is that increased competition in this field is a great thing for customers. You have more options than ever for learning just about anything you want to know concerning web technologies. The big question though is, with so many options available, which is the right one for you? We’ll go over a number of different strategies being used to teach web development and discuss how you can figure out the most appropriate for your unique learning style. We’ll also include some resources to get you started on each available path. With some disciplines, the most difficult part of the education process is finding quality learning resources. This is definitely not the case with web design. The web is completely bursting with both free and purchasable information that will teach you all there is to know about web design and development. The problem then shifts from one of scarcity to overabundance. With so much info available, how can you even know where to begin? Before you answer this question though, I think it’s critically important to discover which learning style is the most effective for you. Once you have this information, you can narrow your resources considerably. If you’ve ever tried and failed to learn something, then this lesson should ring true with you. Sometimes you want to pick up a new skill, but there just seems to be some barrier between you and success. How can you overcome it? In a previous article, I introduced you to the freelancer’s secret to learning any new skill, which I firmly believe is a great way to force yourself into learning. However, even if you’ve put yourself in the position suggested by that article, you still have the actual learning process ahead of you. It often boils down to a question of methodology. Education professionals long ago discovered that people differ in their learning styles. Some people are visual learners, others absorb through reading and some can’t get a feel for something until they dig in with a hands-on experiment. Odds are, you’ll find that you personally have more success using some methods than others. The key then is to find out which learning style you tend to have the most success with and find resources that focus on teaching through this method. Instead of a random Google search that leads to hours and hours of failed learning attempts, try making an educated go of choosing how you learn web design. Doing so could literally mean the difference between another failed attempt and an exciting new career. Though I tend to focus on informal web-based independent learning solutions, I would never discount the value of a formal education. For starters, a university or even community college degree can give your resume the boost it needs to land you that awesome job. Web design and development degrees are quickly becoming fairly ubiquitous. There’s a good chance that the major schools in your area all offer something in this area. Every school worth its salt has a website that lists available degrees and certificates in addition to some estimates for the level of financial investment that you can expect to make, so be sure that local university websites are your first stop. Understandably, a college or university degree is the most expensive route you can take, but it can also be one of the most rewarding. Obviously, if you’re about to enter college and need a degree, then this option is prime territory for you. I’ll focus on the people for whom this decision might not be as simple though: those thinking about returning to school. If you’re an adult who has been in the working world for some time, the decision of whether or not to go back to school is a difficult one. Will the hard sacrifices of time and money pay off in the end? Sometimes they do, other times they don’t. If you don’t have a formal degree of any kind, I recommend that you get one. Potential employers often just want to see that you’re committed enough to get through college without giving up. If you do have a degree, just not in web development, then you might have plenty of success learning on your own. More and more the web industry is beginning to value experience and ability over formal education. Jump into learning on your own, take some low budget jobs to kick off your career and then move your way up the ladder through freelance or the corporate world. If you find that the lack of a web dev degree is holding you back, then you should think about getting one. Otherwise, your time and resources might be better spent on real world experience. You might even consider picking up a class or two where you need it and skipping the full degree. Whether you’re going with an online or in-person degree, the teaching methods will likely incorporate several or even all of the other styles below. There are some unique advantages to the school method though, especially if you’re in a real classroom with an instructor present. Some of us learn better on our own, moving forward at our own pace. The unfortunate truth though is that self-guided learning is super difficult. It’s often far easier to pick up a new discipline if someone is pushing you to do so. School heavily leverages the stress factor to induce learning, a trick that works so well that our entire education system is based on it. With school you have homework, deadlines, term projects and a structured schedule. You either keep up or drop out. If you need to learn a lot of stuff extremely well in a short period of time, there’s almost no better way to do it than a formal class. Further, in-person instruction is a rich learning method that gives you the unique ability to ask questions and get help where you need it, often in a one-on-one conversation. This is something that is extremely difficult or nearly impossible to find in the world of free and even premium online education. If you have a decent budget, learn better in a structured environment, perform well under pressure, and value face to face instruction where you can ask lots of questions, school is your best bet. Written instruction is the spark that lit the fire under web design education. The lowly design blog started as a novel idea and has risen to impressive heights. Even these built on the success of a far older method: books. Once upon a time, when someone wanted to learn something, a trip to the library and/or bookstore, was the first step in the process (not Google). Reading is a timeless way to learn something, it will simply never go out of style no matter what fancy technology comes along. In a highly literate society it is often the go-to method for self-guided instruction. It’s not the most interactive or exciting way to go about learning something, but it’s often the most effective for several reasons. Written learning materials are hard to beat from an efficiency perspective. The average person’s reading speed is much faster than the average person’s speaking speed, so you can pack far more education into a shorter time span than with spoken instruction. For this reason, written instruction often goes far deeper than other methods. Books on web development tend to be massive tomes that are fairly exhaustive and cover every aspect of their topic. Even a fairly long video series on the same topic likely won’t cover a tenth of the material. Even if you don’t want to read a massive, all-inclusive book on a subject, reading is often still the method to beat. Design blogs like the one you’re reading now provide daily, bite-sized learning opportunities that can guide you through every step of your career, from writing your first line of HTML to keeping your advanced skill set fresh and relevant. The downside of reading is that it can get boring if you’re the type of person who tends to favor multimedia. An even bigger hurdle is obviously your level of reading comprehension. You need not be embarrassed, the simple truth is that lots of people simply don’t absorb and retain information well through reading. If you’ve never read an entire blog post (including this one) without skimming and find yourself sleeping in a book more than turning its pages, reading might not be the way to go! Reading-based instructional materials are perfect if you have a high level of reading comprehension and retention. The options here fall on both extremes of the time spectrum: reading can provide you with both the shortest, quickest instruction possible and the longest, deepest learning sessions that you could possibly want. Reading is also hands down the most popular method used for free instruction, so if your budget is nonexistent, blogs and other online resources are the way to go. Reading is for the masses, but don’t mistake that statement as an implication that there’s something wrong with you if this isn’t the best way for you to learn. Don’t waste your time at the library if big books intimidate or bore you, instead search for a learning method that makes use of your interest in richer methods of communication. One of the highest regarded publishers of books for web professionals, A Book Apart create highly detailed and meticulously edited examinations of single topics. They’re brief, don’t take too much effort to dive into, and cover HTML5, CSS3, content strategy, responsive web design, and more. The Smashing Library is a great collection of books created by Smashing Magazine, and other authors, covering an array of different web design topics. Fun, friendly, and approachable is the name of the game here. Instructional videos have been around for nearly as long as video cameras. The concept is nothing new and the effectiveness has been proven over several decades. If you need proof, consider that most of us would never dream of buying and reading through a science book but as soon as a science channel pops up on our TV, we’re enthralled for hours on end. Video based instruction in the web development community certainly isn’t new either, but serious, in-depth and high quality video instruction definitely hasn’t hit anywhere near the level of saturation of written design blogs. This is because video learning materials are incredibly resource-intensive to produce. The equipment, knowledge, software and time necessary to create a valuable product all serve as a high barrier to entry for anyone looking to enter this market. For this reason, the products that do exist tend to be quite pricy. The currently popular method is to sell a subscription on a monthly or yearly basis. You pay a certain fee every month and in turn are granted access to a large body of video content. It’s like Netflix for web education. The learning style here is very visual. If you have no interest in books and find that you often can’t make yourself read through even a brief blog post, video instruction provides an awesome and often quite entertaining solution. This doesn’t mean that you won’t get bored though. If you think that watching a person write code for an hour is going to be exciting, you’re going to be pretty surprised with the reality. For this reason, the instructor leading the videos makes all the difference in the world. Guys like Jeffrey Way and Chris Coyier have the ability to make the educational experience interesting while other instructors unfortunately drone on endlessly in a monotone voice that lulls you into a deep coma from which there is little hope of return. Obviously, video instruction ticks the auditory learning box as well. Some people can read something a hundred times and not retain the information, but as soon as they hear it, it’s locked in their brain forever. If this sounds like you, video courses are likely going to be the best route for you. Pure audio solutions like podcasts do exist, but they’re more for general discussion. It’s nearly impossible to learn code or design without seeing what it is that the instructor is doing. One last thing to consider is that video instruction can be time consuming. Courses are often broken up into five to ten minute segments but on the whole you’ll spend hours and hours watching video to absorb the amount of information you could probably get from a book in half the time. If your television is constantly tuned into educational science, history or technology shows, then you probably really enjoy learning through video instruction. If you think books are lame, then you definitely need to check out this method of learning. Videos are ideal if you can block out specific chunks of time for learning in a quiet environment. If you’re overwhelmed by all of the reading options available, you’ll be comforted by the fact that there are only a few really good video resources available at this point in time for learning web development. Just keep in mind that the really thorough options are almost exclusively subscription based. I’ve worked steadily with the Tuts+ folks over the years, so I’m a little biased but I think it’s one of the best options around for anyone who wants to learn web design and development. From $19 per month you get access to a wealth of exclusive tutorials, both written and video. They’re adding content weekly so your membership only gets better with time! Lynda is one of the oldest and most thorough online resources for learning just about anything technical. You pay a hefty subscription fee but it’s well worth it to access their extensive library of learning videos spanning tons of subjects. Learn HTML and CSS, master Photoshop, take a course on video production and finally take on building that iPhone app idea you’ve had floating around in your head. When I was in college, I signed up for a math course with a stuffy old professor bent on failing as many students as possible. Instruction was fast-paced and questions were almost never tolerated. If you didn’t understand, you didn’t belong there. Consequently, I dropped the class and tried again using a different format. My school had these computer-based learning courses where an instructor was present, but only for support. Most of the learning was done through a computer program that allowed you to go through lessons at your own pace, re-learn troublesome topics, and take quizzes to assess your progress before official testing. The program used a very interactive teaching method that had you clicking, entering numbers and manipulating models constantly. I pulled an A+ in that class as well as subsequent math courses that I took using the same method. The moral here is that for some of us, there’s something magical about computer guided learning. Instead of passively absorbing information, you’re diving into it. Your progress is continually checked so you can’t proceed unless you’re genuinely learning the material. Further, your work is checked not by an intimidating human but by a machine that won’t judge you for going through the same lesson over and over. The interaction model here is closer to a video game than a textbook. The learning style here is obviously a very hands-on approach. If you have a short attention span and get easily bored, even well produced video instruction can be nearly impossible to sit through. The interactive method asks for your input at every step and holds your interest as well or better than any other learning model I’ve ever seen. This method is also great if you’re a particularly fast or a particularly slow learner. If you pick up the information quickly, you can breeze through the content while actually learning the information, not just reading it. Conversely, if your learning process is fairly slow, the computer doesn’t mind! You can enter the wrong answer again and again and you’ll keep getting more chances, and it’s easy to click back and go through a previous lesson at any time. If you like games, you’ll love this method. Your results are saved, your progress through the course is tracked and reported and you often even work towards high scores and trophies or badges. If you’d much rather spend a day in front of your Xbox than with your nose in a book, then this learning method might resonate particularly well with you. Learning becomes a game to be beaten and boring content comes to life. There are some free and premium options here so no matter your what your budget is, you can get started with this method today. I absolutely love this website. It’s a fantastic and currently free resource that’s small but growing fast. Here you can learn programming and/or web development through a series of interactive courses that teach you tiny bits of information at a time and let you type out the code yourself. Codecademy checks your answers and guides you through the learning process in a thoroughly enjoyable and easily approachable manner. In fact, it’s so user friendly that I even told my parents to check it out! Code School is sort of like a premium, paid version of the Codecademy model. For $29 per month, you get access to several interactive courses on web development and programming. You type in code right in the browser just as with Codecademy, but the learning side is more robust and includes some superbly produced video and graphic content. For some, one of the methods above stands out far from the others as the absolute best way to learn. But let’s face it, your typical learning experience will involve more than one of these learning styles. Don’t feel the need to stay within one area, if none of them hold your interest or provide what you need, jump around a little. For instance, I like to watch video courses but I also typically have a book on my desk that covers the topic that I’m learning. Jumping between the two helps keep me interested and allows me to dig deeper than I could with a single source. Your goal should be to find not only your single most successful learning style, but the combination of resources that will ultimately lead to you actually learning the skill that you set out to pick up. Nothing is more frustrating than trying again and again to learn something and coming out no better for it in the end. Building yourself a customized learning plan could be just what you need to end the cycle of frustration. The message that I’m trying to get across here is that you can learn web development, regardless of your past successes and failures. Sometimes something as simple as a style of learning is all that’s holding you back. Exploring your interests and favored ways to learn can dramatically improve your odds of success. Be sure to take some time o consider all of the various methods above and find the one or two that you think will work best for you. It often helps to eliminate those that you know won’t work and use that as a starting point for choosing new techniques to try.